Many of our top-selling holsters offer level 2 protection by securing firearms with an extra snap. 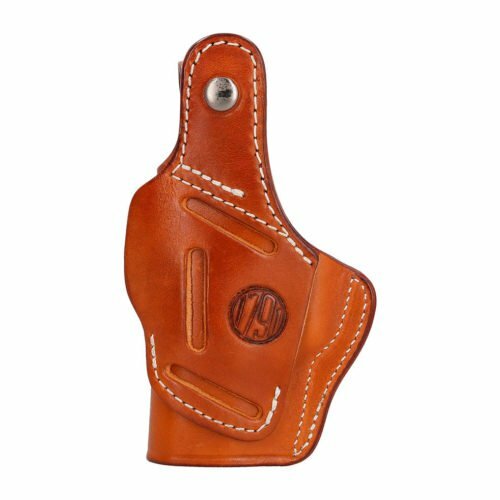 While all of our premium leather holsters come with a snug fit and excellent retention, you want to know your weapon won’t accidently discharge in any situation. 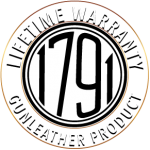 You can count on 1791 GUNLEATHER for a trustworthy, long-lasting holster that keeps you confidently in control. Check out our 3-Way, 4-Way, and Multi-Fit holsters if a thumb break holster is on your purchase list. 3 Way (BHT3) – Carry OWB in a vertical, horizontal, or cross-draw cant; suited for a Glock 17/19/25/26, Smith MP 40, Smith MP 40c, Ruger SR9c, or FNX-9. 4 Way (BHT4) – Carry OWB in vertical, horizontal, or cross-draw cant, or use the IWB conceal carry clip; suited for a Glock 17/19/25/26, Smith MP 40, Smith MP 40c, Ruger SR9c, or FNX-9. Multi-Fit – Wear in the style of your choice, including OWB FBI cant or IWB back cant; carry a wider range of large firearms, including Colt, Browning, Beretta, and Sig Sauer brands. Construction from durable 100% Certified-American Heavy Native Steerhide. Reinforced double-stitching and handcrafting by fourth-generation leather artisans. Forward cant for a ride that sits close to the body and feels natural, no matter the size of your gun. Your choice of Classic Brown, Signature Brown, or Stealth Black in left or right-handed models. 1 ¾” wide belt slots that fit with any standard gun belt. Custom-molding with liners that protect pistol bluing. Lifetime warranty commitment to your satisfaction. Unless you’re carrying concealed or just using your firearm recreationally, a thumb break is a practical concern for law enforcement officers and active carriers. It requires a second of extra effort to draw your weapon by unsnapping a small (usually leather) strap. 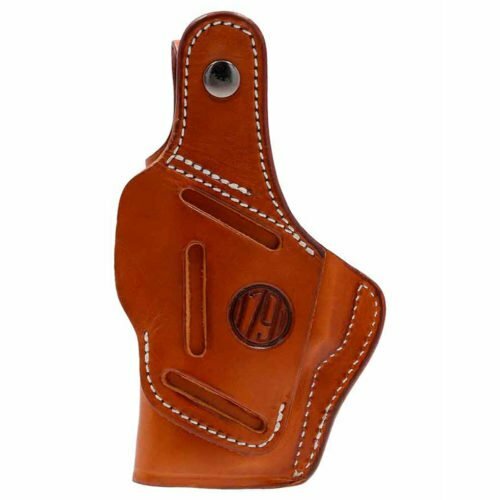 A good, form-fitted open-top holster will not require an extra retention strap, but some wearers like the peace of mind having one provides. Most people prefer the look, smell, and feel of a leather break over Kydex and nylon. The natural body-conforming materials are comfortable for all-day use. 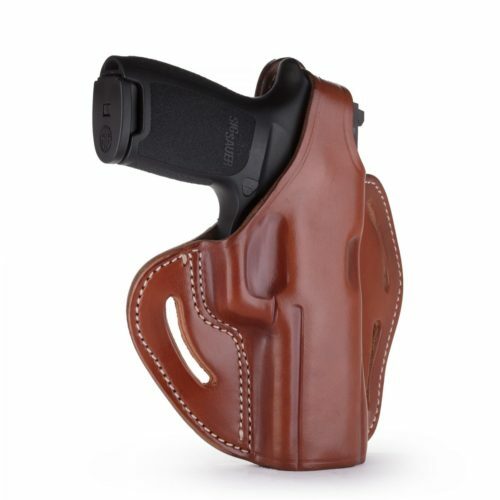 Available in brown or black, it’s easy to match a good-looking leather holster with your gun belt and a pair of leather shoes. A well-maintained leather holster should last throughout the years.